Text messages are relatively simple beasts. They are only 160 characters of text, and can include website addresses and phone numbers. So, with this simple format, what makes a great text message that will have a positive impact on your sales? A great SMS message that sells starts with your business name. It seems obvious, but forgetting this is a common mistake! Identifying your business in each and every message is crucial for customers to understand who the message is coming from, and it’s also a requirement in a lot of countries. To make it simple, the easiest way to include your business name in your text message is just to start the message with it. 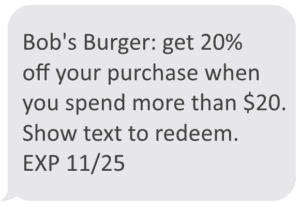 For instance, you can use something like “Bob’s Burger: save 50% off your next purchase…”. So, how to write the perfect text message for your customers? It’s actually pretty simple, always start with the offer! Take for example the two text messages below. Most text messages promotions will have two components, the first being the offer, (i.e. “receive a free soda”), and a qualifier for that offer (i.e. “when you purchase any regular sushi roll”). The key when sending a great text message to your customers is to have the offer very close to the start of the message. On the contrary, the qualifier can be near the end of the message. The reason is that the offer is there to hook the SMS subscribers. You want this hook, the part that grabs their attention, at the start of your text message, not at the end! 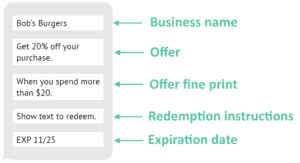 The redemption instructions explain what they need to do to take advantage of the offer. Typically, it can be something like “Show text to redeem”. The expiration date creates a sense of urgency and makes the offer time-sensitive, which is a key component of the offer. To keep it short and sharp, a typical way to mention this is “EXP dd/mm”. Finally, in a lot of countries, you have to include instructions to opt-out from receiving future messages. For instance, this would typically be “To end reply STOP”. Besides the structure of the message, a key think for its success is to keep it short. While writing a text message that is less than 160 characters can be a challenge, it can almost always be done. Take for example the example on the left below: it uses 178 characters, i.e. 18 characters over the 160 characters limit. With a little tweaking, we reduced it to 157 characters, without taking away any key information. We could fit the entire message into one text message, saving money and adding clarity for the customers! Business name: it’s essential that you include your business name in each text message offer you send customers. Offer: then, follow immediately with the offer you’re making to customers. Get them hooked! Offer fine prints: you then tell the customers what is required from them to be able to take advantage of the offer you just made. Redemption instructions: you tell customers how to redeem the offer. Expiration date: and make sure your customers are aware of when the offer will expire. Use that template and start writing winning SMS messages!